JCAHO issued a Sentinel Event Alert on January 27, 2006, advising health care providers to perform medication reconciliations at every transition of care in which new medications are ordered. Medication reconcilition should be performed to avoid medication errors such as omissions, duplications, dosing errors, or drug interactions. The alert states that the medication reconciliation process should comprise five steps: 1) develop a list of current medications; 2) develop a list of medications to be prescribed; 3) compare the medications on the two lists; 4) make clinical decisions based on the comparison; and 5) communicate the new list to appropriate caregivers and to the patient. For more details read the full Sentinel Event Alert, "Using medication reconciliation to prevent errors". The Securities and Exchange Commission ("SEC") on January 27, 2006, posted a proposed rule revising the rules governing disclosure by public companies of executive compensation and director compensation, as well as addressing director independence, related party transactions, and other corporate governance matters. Although I have not read all 370 pages of the proposed rule I suspect that nonprofit health care providers should examime the proposed rule and the inpact it might have on their individual facilities. Nationwide and in West Virginia there has been an increase in public scrutiny over the executive compensation levels of many executives of nonprofit health care systems and facilities. The Ohio River flows behind my dad’s house in New Martinsville. I took this photo while I was home in New Martinsville over the holidays. This is the view from the kitchen and dining room. Notice the moon still shining. Over the years our family has grown accustomed to the Ohio River flowing by with all its beauty, changing from day to day and season to season. It’s a photo like this that reminds me how beautiful it can be. I'm often struck when someone visits our house for the first time and is mesmerized by the beauty of the river and fascinate by the tug/barge traffic as it goes up and down the river. I was playing around with a new feature that I noticed on Flickr that links you to Zazzle.com. You can take a photo on Flickr and create a custom stamp. If you haven’t checked out Zazzle (or Flickr) give them a whirl. Zazzle is such a simple concept -- it allows you to create things using your (or some other artists) artwork, photos, etc. I was thinking about creating a few stamps using this photo to send to my dad as a gift. To start creating a real U.S. postage stamp with Zazzle, first head over to one of your photos. On your photo pages, you will see an "order prints" menu button: Click the "Order Prints" button and find the Zazzle option at the bottom. Have fun — and send us a postcard! The Healthcare IT Guy, has a thought provoking post, "$10K vs. Patient Data Backup Tapes," discussing the need for businesses and health care providers to become more aware of how they handle and protect (or fail to protect) confidential business and health care information, including customer, patient and financial data. Due to the shift occuring from a traditional paper based world to an electronic storage (often very mobile storage) based world we continue to see an increase in data being lost, stolen or otherwise compromised requiring businesses and health care providers to report and publicize such data disasters. The recent $10M fine by the FTC against Choicepoint should make business and industry to take note of the potential exposure, financially or otherwise, that can accompany a breach of data. A hearing on the Department of Justice's Motion to Compel Compliance with Subpeona Duces Tecum has been set for Febuary 27 before U.S. District Court Judge James Ware in United States District Court for the Northern District of California in San Jose. The Declaration of Joel McElvain, Trial Attorney for Department of Justice, provides additional background details including the original DOJ letter request and subpoena duces tecum to Google seeking materials relevant to its defense in the ACLU vs. Gonzales matter, responsive letter by Google's counsel and Protective Order entered by the Court in the ACLU vs. Gonzales matter. Also, the Declaration of Philip B. Stark, Ph.D. filed in support of the Motion to Compel Compliance with Subpoena Duces Tecum is interesting to provide a context and background of the reasons the DOJ is seeking the search engine information in connection with the ACLU vs. Gonzales matter. According to the Yahoo news article, Judge Ware also set a February 6 date for Google to file its response in opposition to the Department of Justice's motion to compel and a February 13 date for the DOJ to file its reply to whatever Google has to say. Interesting reading for those of us who have filed motions to quash subpoenas or defended motions to compel involving requests for the production of private and confidential information, especially those situations where the subpeonas are issued to non-party participants in the underlying litigation. WebMD has rolled out a number of new health topic blogs. This weeks edition of Grand Rounds hosted by Kevin, M.D. featured some of the posts on the WebMD Health Blogs. After scanning some of the blogs the quality of the content looks great. I have subscribed to a couple RSS feeds to follow posts on topics of interest to me. The health blogs cover a wide variety of topics of interest to health care consumers. Some of the blogs are by health care experts (notice the EV "Expert View" designation) and other are by WebMD members. Based on the archives from most of the blogs it appears that WebMD has had this project up and running since November 2005. I looked for some additional information on the WebMD member blogs but could not find any information. The curious lawyer in me was interested to understand how members are chosen to be a WebMD sponsored blog. Are there any restrictions placed on posting? Are the members compensated for blogging? etc. WebMD would benefit by having a disclosure and general summary of blog policies and background on the blogs on the main blog page. I'd like to welcome all the new bloggers to the growing network of bloggers focusing on health and health care industry topics. I'm planning on attending the "Hospital and Health Systems Law Institute" sponsored by the American Health Lawyer Association in Ft. Lauderdale, Florida from February 9-10. If any regular readers are attending the AHLA event and want to have lunch and discuss health care, blogs, etc. please drop me an email or post a comment. If you are a health care lawyer and not familiar with the AHLA you should check out the association. They offer great benefits to members and have first rate continuing education events. 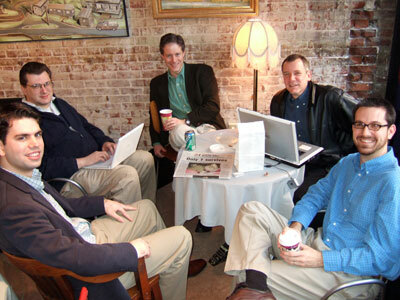 Just a reminder that the Charleston Area Bloggers will be gathering again at Taylor Books on Wednesday, Febuary 1 @ 8am. Even the She-Women Man Haters Club members are welcome. Come one, come all bloggers and blawgers (check Technorati for updates on the continuing debate of blawg vs. blog). It highlights that lawyers just love to argue over portmanteau words. Some blogger trivia - Who originated the term "blawg"? Free coffee on Feb 1 for the first to post a comment with the answer. The first CAB get-together was a big success and I'm looking forward to getting back together and meeting a few new local bloggers. If the event grows much larger we might have to rent out Taylor Books. Since the Legislative session is in full swing -- I'm already lobbying for CAB 3 (TBA) to be held at Chris' Hot Dogs on the West Side for dogs and fries. If Ms. Howell can coin the term "blawg"then I'm claiming "doggers". (check out our resident West Virginia dogger). For those interested in the use of Google as a health care search engine you should read Jane Sarasohn-Kahn's Commentary at iHealthBeat titled "Paging Dr. Google". Ms. Sarasohn-Kahn is a health economist and leads Think-Health. The commentary is very thought provoking. I'm fascinated (and a bit scared) about the ideas of Googling my genetic information and how Google will play a role in evidenced based medicine and the electronic medical record revolution. The commentary also mentions a Healthline.com, new player in the online health care information and earch engine field, that I ran across in a number of articles over the last month. Congrats to Marc Weintraub, a friend and attorney colleague here in Charleston who was featured as a 2005 Associate Marketing All Star on the Associate Marketing Mentor blog. I often share posts on this blog with the associates at our firm. It is a great resource of information for attorneys interested in marketing, rainmaking and client development. West Virginia plans to expand a pilot project using "Dance Dance Revolution" to fight child obesity in West Virginia. The object of the project is to get sedentary kids more active by enticing them with interative video games. The pilot project will be expanded to 157 middle schools throughout the state and plans for futher expansion. For more info on the project check out this article in the San Francisco Chronicle. I'm sold on the project after having spent half of my Christmas holiday jumping up, down and sweating on my nieces new Dance Dance Revolution game. I was skeptical about the project when I heard it announced last year -- but the game is addicting. Our entire family had a great time using the game. We even got my 82 year old dad up on the game -- I only wish they would have had some big band swing tunes for him. West Virginia is consistently among the top three states for obesity, with about a third of its residents considered obese and even more overweight, according to the state Bureau of Public Health. Nearly 46 percent of 31,000 fifth-graders screened in a coronary artery risk project from 1999-2005 were considered overweight or obese, according to the Institute of Medicine guidelines. I'm just waiting for the litigation fallout from the project. I received the following press release from the Governor's Office this morning. Please lower your flags and take a moment to remember the loss of two more lives in West Virginia. On a seperate note I was curious to see the lack of national press coverage of the second mine disaster in less than a month. I had CNN and some of the other news media giants on over the weekend when the story was unfolding and there was more press coverage for a whale. Actually the lack of media coverage was probably a blessing for the families and community involved. Last night the Legislature passed SB247 a mine safety bill that requires rapid reporting of accidents, tracking devices and portable air supplies in mines. The bill was introduction and passed in the same day. It shows how quickly the Legislature can work on a bill. CHARLESTON, W.Va. - Gov. Joe Manchin has ordered all state flags displayed at state facilities lowered to half-staff in memory of the two miners who lost their lives this past weekend at the Aracoma Coal Company’s Alma #1 Mine in Melville, W.Va. State flags are to remain at half-staff until sunset on the day of burial of the last victim of this accident. The Office of Inspector General (OIG) released the following report on Medicare Payments for Ambulance Transports(OEI-05-02-00590). The OIG evaluated whether ambulance transports met Medicare’s coverage and level of service criteria and to evaluate safeguards in place to identify improper payments. Access to health care in West Virginia is a major issue because of the rural nature of the state. We also face of the hurdle of having a very poor and elderly population who often don't have access to transportation. I'd be interested to see the percentage in West Virginia that do not meet the Medicare program requirements. I suspect the number might be even higher. I certainly recognize the need to hault purely fraudelent activities involving unnecessary transportation of patients by emergency vehicles but there also have to be initiatives to assist the poor and elderly in getting to and from providers, dialysis treatment and other nonemergency care. Medicare covers and pays for emergency and nonemergency ambulance transports when a beneficiary's medical condition, at the time of transport, is such that other means of transportation, such as taxi, private car, wheelchair van, or other type of vehicle, would jeopardize the beneficiary's health. We found that 25 percent of ambulance transports in calendar year 2002 did not meet Medicare program requirements, resulting in an estimated $402 million in improper payments. Despite previous OIG inspections indicating that transports for dialysis treatment and other nonemergency transports were particularly vulnerable to abuse, the error rates for these kinds of transports continue to be high. We found that 27 percent of dialysis transports and 20 percent of other nonemergency transports did not meet Medicare's coverage requirements. In contrast, only seven percent of emergency transports were found not to meet requirements. We also determined that contractor safeguards are insufficient to identify and prevent improper payments for ambulance transports. Contractors use few ambulance-specific prepayment edits consistently and fewer than half of the contractors conducted postpayment reviews of ambulance claims. When reviews are conducted, there is no uniform requirement regarding the documentation that should be reviewed. While almost two-thirds of the coverage errors involved a transport from a dialysis facility, hospital, or other third-party provider, these providers received little education regarding Medicare's coverage requirements for ambulance transports. OIG recommends that CMS implement program integrity activities designed to reduce improper payments for ambulance transports at greatest risk for error, such as dialysis and other nonemergency transports. Included in these activities should be: (1) instructing all Medicare contractors to implement prepayment edits that target dialysis and nonemergency ambulance transport claims; (2) instructing all Medicare contractors, when conducting postpayment medical reviews, to obtain documentation from ambulance suppliers and third-party providers to determine that ambulance transports meet program requirements; and (3) directing all Medicare contractors to educate third-party providers responsible for initiating ambulance transports. Once this is accomplished, CMS may want to examine whether third-party providers continue to order noncovered ambulance transports. If third-party providers are still problematic, CMS may want to examine other administrative actions that can be taken and any potentially fraudulent or abusive providers should be referred to OIG. Centers for Medicare and Medicaid Services (CMS) has issued a Proposed Rule, "Medicare Program; Prospective Payment System for Long-Term Care Hospitals RY 2007" setting out the payment levels for long-term care hospitals (LTCHs). The proposed rule will be published in the Federal Register on January 27, 2006. CMS will accept comments on the Proposed Rule until March 30, 2006. July 1, 2006, through June 30, 2007, would also be derived from the LTCH PPS rate year calculations. 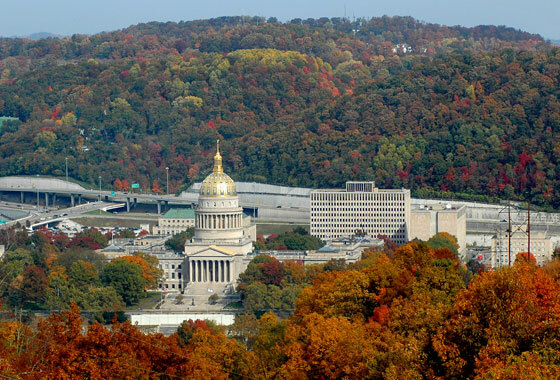 The 2006 West Virginia Legislative session began on January 11, 2006. For more information on what is happening at the Capitol check out the Legislature's website. Over the last couple of years they have added a number of new features which allow the general public the ability to stay informed about what is happening on the floor at the Capitol. You can get the Daily Summaries with links to the bill history and further links directly to the draft and final bills. Its a great way for all West Virginians to stay up to date with the actions being taken (or not being taken by their legislators). You can also read the Senate and House Daily Journal which provides more details of what happened on the floor of each house. For those unfamiliar with the bill process -- one of the most important keys in understanding what bill you are currently looking at when you go to the actual bill text is whether it is the introduced bill, the engrossed bill, the enrolled bill, a bill originating in committee or a committee substitute bill. Below is a key that is useful when looking at the bills. intr = The bill is officially started in the Legislative Process. eng = The bill after it has been read a second time in its house of origin. enr = The final version of the bill. sub = An amended version of the bill recommended by a committee. For some basic information about how a bill becomes a law in West Virginia check out "How a Bill Becomes a Law". Something new that I hadn't noticed in the past is that the Legislature Capitol Photo Gallery. The panoramic photo of the new Capitol dome above is a link from the new gallery. The Centers for Medicare and Medicaid Services (CMS) have done a web site redesign. I haven't had a lot of extra time to drill down at the content to see what physical changes have been made but I like the new look. Check it out. The WSJ.com Law Blog reported yesterday and today that Opinionistas, the anonymous law firm blogger that I previously mentioned in this post has gone public. Opinionistas, 27-year-0ld Melissa Lafsky, created a stir over the last year with her anonymous blog detailing life as an associate in a large New York law firm. WSJ.com Law Blog also points to an article appearing in today’s New York Observer story by Anna Schneider-Mayerson. I missed tonight's live state of the state address because I was busy putting kids to sleep -- but thanks to technology you can check out the video replay or read the full text version on the Governor's Office website. There are also copies of the 2007 budget overview in powerpoint and pdf. It has been a difficult week in our state. Just seven short days ago, we lost 12 hardworking and brave West Virginians; men who left their homes each day knowing the inherent difficulty and danger of the jobs they performed and men who were proud to provide for their families, proud to be a West Virginian and proud of the energy they produced to keep America strong. We cannot know the purpose of this tragedy - but I assure you we will discover the cause. I am committing every resource available to me to aid in the investigation - not only to determine what happened inside the Sago Mine that caused this terrible accident, but also how the information received outside of the mine regarding the condition of the miners could have been so horribly wrong. Families should never be put through such a heartbreaking, emotional nightmare. Even more important, I rededicate myself and the State to the task of making our mines the safest in the country so that we can avoid future tragedies like the one we have just experienced. Our prayers as a state are with the families of Thomas P. Anderson, Alva Martin Bennett, James Bennett, Jerry Groves, George Junior Hamner, Terry Helms, Jesse L. Jones, David Lewis, Martin Toler Jr., Fred Ware Jr., Jackie Weaver and Marshall Winans. During the coming days, we will continue as West Virginians to do what we do best - come together in support of our neighbors. We did this when the disaster of Hurricane Katrina hit the people living in the southern states of America, and we do it again now for our own. I want to thank the thousands of West Virginians who have donated goods, as well as their hard-earned money, to the miners' families over the last several days. Words cannot express to you how proud I am to be Governor of a State that is home to such amazing people. I also want the miners' families to know that the support that we offer will be ongoing. And so, my office is joining with the West Virginia Council of Churches to establish a "Lifeskills Account" for the immediate family members of the victims. To demonstrate the importance of this effort, my office will be contributing $100,000 from the Governor's Contingency Fund to this account. These men were working hard to provide a good living for their loved ones, and we must continue their efforts. The money donated to this account will provide for traditional educational opportunities plus any trade or technical field training that they may wish to obtain in order to expand their knowledge and gain the skills needed to support themselves and their families, no matter what their age. We want them to know that we will be in this with them through their long journey. I would like to now thank the Reverend Dennis Sparks with the West Virginia Council of Churches for agreeing to administer this very special account on our behalf. Reverend Sparks, please stand and be recognized. Many times during the rescue efforts you heard me say that West Virginians believe in miracles - and we do. While we didn't receive the 13 miracles we were praying for, we did receive one - Randal McCloy Jr. It is my hope that he can one day tell us his miracle story and the stories of his friends and co-workers. So let us also remember his struggles tonight and send him, his wife Anna, their two children, Randal III and Isabelle Hope, and their entire family our prayers and love as well. During our time of crisis, the nation has been watching. They have learned a great deal about West Virginia values and our belief in family, faith in God and the love of our neighbor. In addition, they've learned a great deal about mining families and their strength, work ethic and sense of community - there are no better people on the face of this earth. And, as a follow up to an initiative that was started during last year's State of the State address, we will form, through legislation, a statewide Health Information Network. With this network, West Virginia will become a national leader in the conversion to electronic health records - which it is predicted will result in an increase in healthcare quality and the type of dramatic cost savings that can significantly impact the state's budget. In addition, as part of this overall electronic medical records initiative, the state will also coordinate with HEALTHeWV, an electronic medical records program supported by Senator Robert C. Byrd and managed by the National Technology Transfer Center at Wheeling Jesuit University. As previously announced by the Governor he also mentioned his desire for a more streamlined and practical medical billing system in West Virginia. I am also committed to working with hospitals and providers on achieving some form of an integrated medical billing system in West Virginia. It makes no sense to me that when you have a medical procedure performed at a hospital or clinic, they can't tell you upfront what it's going to cost. Then after the procedure is performed, you don't receive a complete bill and, if you're like me, you have no idea what the total cost was. This is the only service that I know of in America that operates under these billing procedures. Now is the time for us to change this process. Interesting HIPAA preemption appellate decision out of Ohio finding that the Ohio physician-patient privilege statute preempts HIPAA since it provides greater protection to patient privacy. The decision in Grove v. Northeast Ohio Nephrology Associates (Ohio Ct. App., Nos. 22594, 22585, 12/26/2005), involved a malpractice claim for damages where the plaintiff was injured in a car accident by a patient who had just had dialysis treatment at the facility. The claim asserted that the dialysis provider was negligent in letting the patient drive following treatment and sought the non-party medical records of the patient. The dialysis provider objected to producing the records relying on Ohio's patient-physician privilege statute. Most interesting out of this decision is the fact that the dialysis provider could have provided the information under HIPAA since a court order had been issued requiring the production of the information. The decision highlights that the court order exception allowing disclosure under HIPAA without patient authorization is not a mandatory provision. The HIPAA court order provision states that a provider "may" disclose protected health information pursuant to a court order -- but does not say must disclose. For more information on the decision and summary analysis of the decision check out the HIPAA Blog. Thanks to the HIPAA Blog for the tip on this decision. The West Virginia Supreme Court of Appeals recently approved numerous amendments to various rules. Also the Court has made available for public comment other proposed rule changes. The Court also makes available various forms that lawyers might find useful in daily practice in West Virginia. Interesting editorial appearing in the January 6, 2006, edition of The Philadelphia Inquirer discussing the impact of pending litigation involving the "privacy rule" under HIPAA. The editorial looks at ongoing litigation pending in federal court before the Third Circuit. The editorial brings back to the forefront one of the highly debated questions when the proposed privacy rule became final. The issue of whether patients should have the right to give consent for all releases of private health information vs. allowing the release of specific health information without obtaining consent. The final rule was modified removing the consent requirement and replacing it with a general rule that allows releases without prior consent in common situations where health information is needed by some third party (for those who understand HIPAA these are the "treatment, payment and health care operations" exceptions under HIPAA). Thanks to Alan Goldberg via the American Health Lawyers Association Listserve you can also check out the Petition for Rehearing and Rehearing En Banc in Citizens for Health et al. v. Michael O. Leavitt, Secretary, U.S. Department of Health and Human Services. West Virginia ranks 3rd on the American Tort Reform Association's "Judicial Hellholes 2005". Here is a correction to the summary of West Virginia after Ken Ward, Jr. at The Charleston Gazette, notified the ATRA of an error in the West Virginia section of the report. My favorite quotes about West Virginia appear on the second page of the report. "West Virginia was a 'field of dreams' for plaintiffs' lawyers. We built it and they came." "As long as I am allowed to redistribute wealth from out-of-state companies to in-state plaintiffs, I shall continue to do so." Thanks to InhouseBlog via the Association of Corporate Counsel for the tip on the new report. Health Care Law Blog has been selected by RedOrbit as one of its Red Hot Blogs of the Day. Don't know how I was selected but I appreciate the recognition. Here is a direct link to RedOrbit's Red Hot Blogs of the Day. Here is an archive of RedOrbit's Red Hot Blogs of the Day. A topic from today's blogger-get-together was Google's use of braille for its logo. Here is the reason why -- courtesy of Scoble. The Charleston Area Bloggers (not cloggers) met today at Taylor Books for coffee. Everyone enjoyed meeting each other. It was a diverse group of area bloggers from political blogger to IT blogger to health law blogger to photo blogger to random thoughts on a little bit of everything. Below is a photo posted live at the event by Rick Lee of On Location With Rick Lee. Pictured from left to right are Will Stewart, Bill Gardner, Bob Coffield, Rick Lee and Stacey Abshire. It was a bright spot in a day that was very somber for many West Virginians. A day that will be remembered by many West Virginians for years to come. Rick's photo tells the story better than any words. 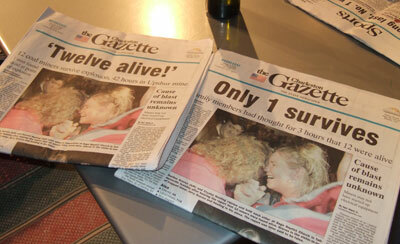 Some people in West Virginia got the first run of the Charleston Gazette and others got the second run. Thoughts and prayers go out to the families and friends of the miners who lost their life and the citizens of Upshur County. Also a thanks to all West Virginian miners past and present that help to make the electricity that you and I take for granted. Everytime you turn on your computer remember where that power came from -- probably a miner in the United States. Some interesting coal facts from the West Virginia Office of Miners', Health, Safety and Training. In the United States, the demand for electricity has increased 136% since 1970. National demand for electricity is expected to increase by another 24 percent by 2020. It has been estimated that 13 percent of the national power requirement is taken up by activities associated with computers and information technology. Other posts about the event here and here.